Justine and her team gave us the most amazing wedding day. We were so impressed with everyone, from organising everything with Tracy, to Saminas brilliant hair and make up skills on the day. The violinist was amazing, as was our photographer Mel. Everything went so smoothly on the day, we couldn’t have asked for more. 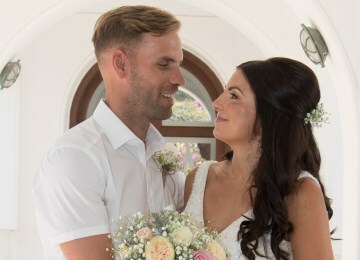 Myself, my husband and all of our guests were so impressed with the ceremony and reception venues we had chosen, and the Unforgettable Rhodes Wedding team had done so well in decorating the venues for us! 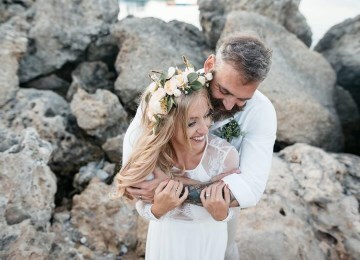 We really couldn’t have asked for more, and would definitely recommend using Unforgettable Rhodes Weddings for anyone planning a wedding in Rhodes. Thank you so much!! Absolutely fantastic from the start. The communication was easy and straight forward and everything ran to plan. I can't thank Justine and the crew enough for rescuing my wedding after a sudden venue change, and for making it all easy and stress free. We had the most wonderful day at the gorgeous Lindos Bay. Thank you all again, you're amazing. Where do I start? From the beginning Justine and her team have been amazing. They’ve taken all the stress away from planning a wedding even with a venue change which was out of everyone’s hands. It’s difficult to imagine what your venue will look like when you can’t visit it but they made it look so beautiful, elegant, classy and exactly as I’d imagined. Samina was incredible with hair and makeup, the bridesmaids my mum and I all felt like princesses and received so many lovely compliments. The photographers and driver put us all at ease and gave us a good giggle as did Justine who is hilarious. The flowers were absolutely stunning, the violinist was perfect... I could go on all day about what an awesome team of lovely people they are. 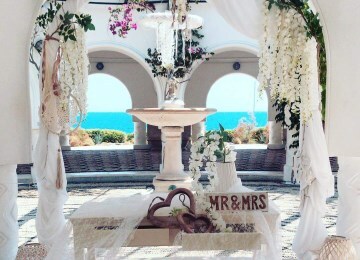 I would recommend to anyone wanting to marry in Rhodes. 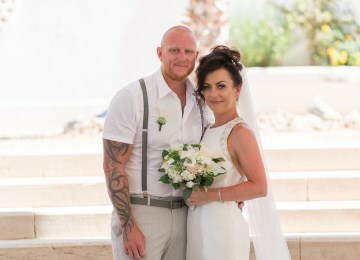 My Husband and I had our dream day and cannot thank everyone involved at Unforgettable Rhodes Weddings enough. Amazing people, amazing attention to detail and amazing value for money. Thank you so so much! From start to finish Tracy, Michelle and Justine were supportive and always available to talk to. Everything involved in planning was smooth and no errors occurred. My husband and I got married at Filerimos cross and followed by a reception at the Sheraton hotel. 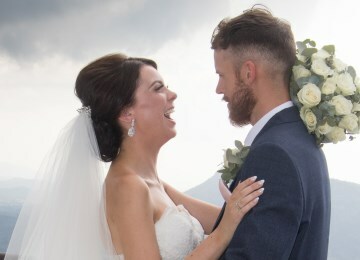 First of all we were forecasted thunderstorms, which isn't great news for an outdoor wedding and then unfortunately I was taken ill with tonsillitis and an allergic reaction to antibiotics and so I was taken to the Euro medical hospital the night before the wedding! Me and my Mum sobbed at the thought I wouldn't make my own wedding day and Justine was so supportive and in constant contact with my parents. Behind the scenes Justine and Michelle were trying to make back up arrangements in case I couldn't attend. Thanks to lots of medication I got to walk down the aisle and had the best day of my life, plus the rain stayed away! The ladies at Unforgettable weddings are kind, supportive and so hardworking that I just couldn't possibly find fault even if I tried. 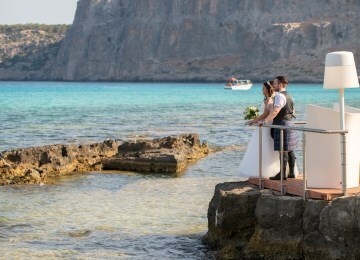 I would recommend them to everyone thinking of an abroad wedding. Thank you ladies for helping me to have the best day of my life. I'll be forever grateful. Just want to thank everyone involved with our wedding day. 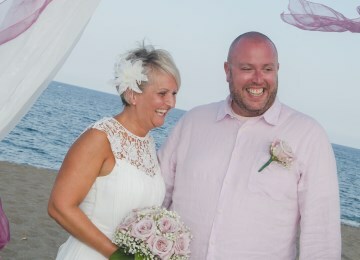 Me and Kris were married at kalithea and carried on our reception there it was beautiful and we had the best day ever. 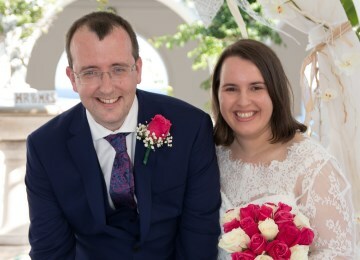 Thank you so much to Justine and her great team, everyone asks about organising a marriage abroad and if it’s stressful, and I can imagine it is if you go alone but we really had nothing to do except a few emails and making a few choices that were sent over to us. We had our Wedding at St Sofia and it was a gorgeous venue and decorated perfectly from the wedding planner team. I asked about flowers and decorations, drinks etc and what would Justine recommend and she was always very honest and said she thought we had to much or to little and I imagine if we tried on our own it would have cost us double in price to what we paid. We had our reception at Philosophia in Pefkos and it truly is amazing, Barbara and Phillip and team literally couldn’t do enough for us and spoilt us rotten. The day was so much better than I ever expected it to be, and was timed and planned to perfection. One bit of advice I would say is, men do not wear trousers n waist coat!! I have never been so hot ha. 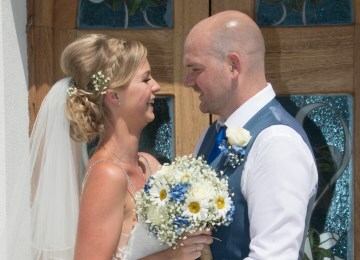 Everything was timed to perfection from my wifes hair and makeup to coaches collecting 106 guests, to getting us everywhere on time and doing anything possible to make my wife and I and all our guests relaxed and free to just enjoy our day. I can’t praise the venues and Justine and her team enough! Had the most amazing wedding experience from start to finish. Nothing was ever too much trouble for Justine. We met her prior to the wedding last year and we instantly clicked and knew we’d made the right decision. We would just like to thank all of the team.... we could not have wished for our day to be any more special as it was perfect. Justine and her team went above and beyond and we can not thank you all enough. A massive thank you to hair & makeup and the photographers. You are all truly amazing and we can not thank you enough. Big thank you to all at URW for all the planning you put into our wedding day. You all as a team are amazing and nothing was a bother to any of you. You took all the stress of planning our big day away and helped us enjoy the planning. I spoke to Tracy alot of the time and she was amazing always answered anything we asked, when ever we contacted her she would always get back to us within a day. WE were the lucky winners of the competition and we were truly grateful and very shocked when we found out that we had won. Thank you again to all the staff for all you have done for us. Highly recommend. Take care and keep up what you do. A big thank you to Justine and her team for making Wendy and my day just as we wanted. We said from the beginning we wanted no stress, and that is just what we got. 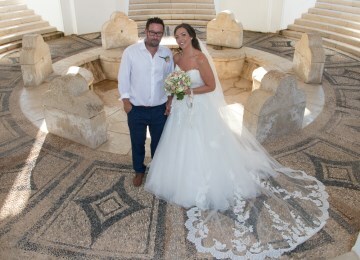 Together with Mel the photographer and Tsambikos Taverna, everything was just perfect. Justine, thank you so so so much for making our dream wedding a reality! I know I didn't make it easy and you really did an amazing job. Every time I had a question it was answered efficiently and you went above and beyond for us when I was in resort to really make sure we could get our vision across. Such an amazing team!! Justine and Tracey went out of their way to make our day the best day of our lives. Can’t thank them enough. They have the best contacts for everything and anything. Thank you so much for everything. Wish we could do it all over again. Could not fault it! The team was running around doing anything needed, even took the guests to a local bar due to them being very hot whilst waiting my arrival. I was always a little on edge letting someone else plan my wedding especially in a different country, but all turned out amazing! My driver Christos was hilarious and so lovely. Samina went above and beyond to give me the look i wanted. Mini the DJ did an amazing job, not just music but amusing the children. The greek dancers was so much fun... boat cruise was stunning. Floral stands made the pictures that bit more perfect. My pictures were lovely. My biggest piece of advice as a bride is if you want something that bad book it dont matter what people say just do it... one thing I wish we had was a videographer. Thank you so so much Unforgettable weddings! 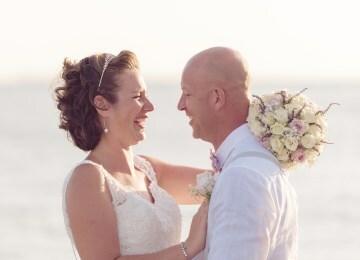 Thank you so much to Justine and her team who organised exactly what we wanted at Kalithea Springs. 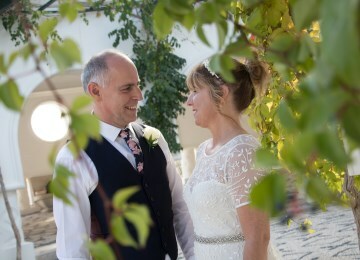 A relaxed but beautiful ceremony for me and my partner. We eloped and she also made sure that no one knew and didn’t post anything etc which was a sigh of relief. I’d fire random emails at her and she’d always reply with exactly what I needed to know and never made me feel like I was asking a stupid question. She made everything so easy and when we met in Rhodes, she instantly made us feel at ease about our day and was so down to earth yet professional. We loved everything about our ceremony and the photos are beautiful.We can’t thank you enough. Well what can I say... we had the most magical wedding ever! 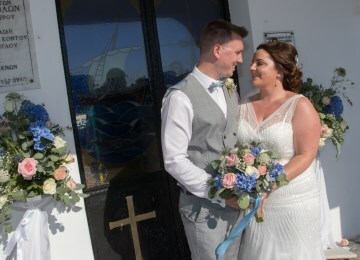 I had originally booked St Pauls Chapel, because of this we had booked our hotels in Lindos (Lindos View, brilliant hotel) and also booked our venue Tambakio on St Pauls Bay. Justine and her team made all the stress of moving the ceremony to Kalithea Spa effortless and I am actually over the moon that we ended up getting married at Kalithea as this venue is just stunning and beautiful. I was a bit apprehensive at first as I had to get 66 guests from Lindos into Rhodes but the drive and transport from Lindos to Kalithea was great and the owner of the travel company who took myself and my dad was brilliant so professional and couldn’t have asked for a better service. Tambakio restaurant for our wedding party was just out of this world and the surrounding and settings are just breath-taking. Special mention to our DJ we had booked through Justine as she was just amazing and entertained all my guests all evening. The small details that the team put in do not go unnoticed, due to the surroundings of Tambakio I didn’t need to go overboard to dress the venue but when I arrived it looked better than I could have ever imagined. From start to finish Justine and her team are on hand to answer any questions and help you organise your wedding just how you want if not better. I would choose Unforgettable Weddings again in a heartbeat and wish we could do our wedding all over again. I need to say a massive thank you to the whole unforgettable rhodes team. They made our day so magical and fabulous .Everything was so well organised and all came together perfectly. We loved every minute of the day. 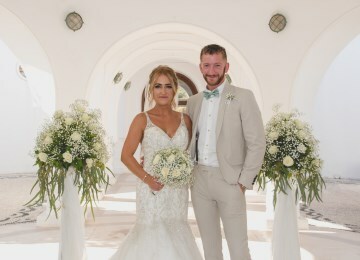 We loved the greek dancers, and the wedding planners set up our reception venue exactly how we visioned it,even though they had not done a wedding there before. David and I had a fantastic day. Justine and the team were great ensuring everything went smoothly and everyone was happy and relaxed. Ceremony and reception were perfect. If anyone is thinking of getting married in Rhodes, they have to use this company. Professional, friendly, funny, genuine and super organised. We had our ceremony at Kalithea Spa and the reception at the Lindian Jewel. Absolutely everything was perfect, start to finish; and this was purely down to Justine and the team’s excellent planning and coordinating. Well it’s back to reality and we’re both looking back on our amazing day. Justine, you and your team out of this world and we can’t thank you all enough for making our day so special. Your whole team were amazing with Jodie from start to finish and for that I thank you. Samina did an amazing job and everyone has commented on how happy they were and how amazing everyone looked. 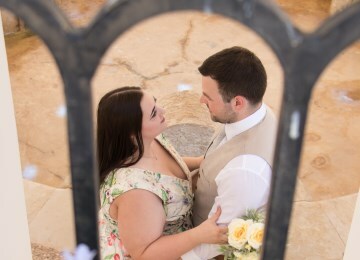 The photos are stunning (we’ve forgot the ladies name) but she was so professional and she’s unbelievably good at what she does, we can’t thank her enough for the shots she got, again everyone has commented on our pictures when we got home. Michele is a diamond and made us feel so confident that you guys would make our day perfect. Tracy, thank you for been patient with us, I know you had to chase us a couple of times but you also made it so easy from start to finish. You guys rock and you're all out of this world, true professionals and it’s been so nice to work with you all. Where do I start.... from the moment we booked to the big day everything was so easy & so stress free. 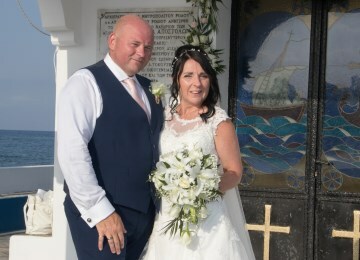 From Tracy in the UK who was always so quick to email back, nothing was ever too much trouble... to Justine & Michele in Rhodes, who are so lovely & made the day really special and stress free. Samina who did our hair and makeup, made us all feel really pretty and special. Mel the photographer was lovely, made me feel really comfortable and took some lovely photos, shes a real professional! I can't recommend this company enough.... they are the best in Rhodes!! Thank you so much for everything. We can’t thank Unforgettable weddings enough, Justine and her team were amazing from start to finish - from emailing Tracy getting everything right for us what we wanted to everything being just what we want on the day. Had our meeting when we arrived in Rhodes, went through everything with Justine and Michelle we felt at ease with them and confident after meeting that everything was going to be perfect. And it was more then we ever expected! Samina was fabulous doing me and my 7 bridesmaids hair makeup, our photographer Mel was lovely very professional, our driver was lovely very chatty on drive up to St Sophia. We originally were booked to have wedding at St Paul’s but we had to change it and I’m so pleased we picked St Sofia. 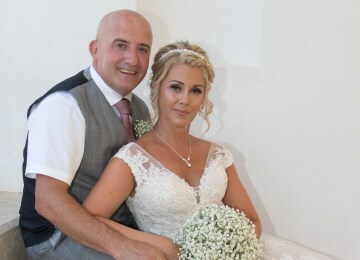 It was magical, our pictures are stunning, we had Mark singing for us at chapel he had all our guests in tears also carried on to be our DJ, he kept all our guests up dancing he was fab too. We want to say a massive thank you to all the team. From starting to organise our dream wedding a year ago Justine and the team have been amazing, nothing was too much trouble. 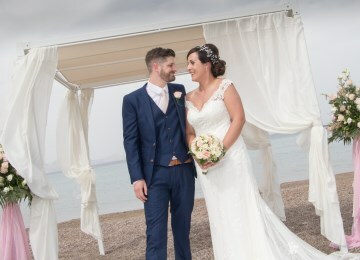 Samina did an outstanding job on my hair and make-up, my husband was blown away and shed many tears when I arrived :) the ceremony at kalithea spa was beautiful and exactly what we wanted, our reception at Pane di Capo was stunning, we were well looked after by the staff. Mel our photographer was fab and we were lucky to have the sunset in our pictures, can not wait to see them! Minnie our Dj kept the guests dancing all night long and our fireworks were a lovely touch, looked stunning over the bay. Today I am celebrating my 1 year wedding anniversary with my wife. 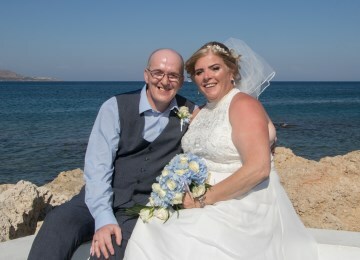 I just wanted to thank Justine, Tracy, Michelle and for helping to organise our wonderful wedding last year in Rhodes at Kalithea Spa and reception at the Sheraton Hotel. The day was perfect. 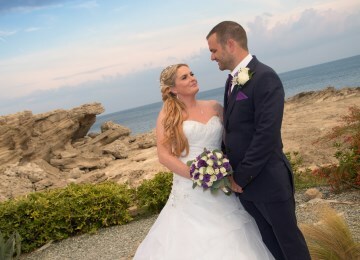 We would highly recommend Unforgettable Weddings to anyone thinking of getting married in Rhodes. 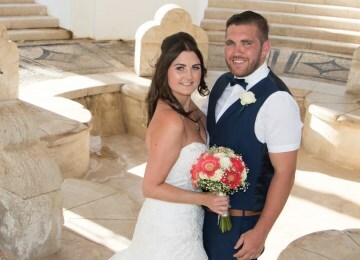 Highly recommend Unforgettable Rhodes wedding from the start of planning my vision for our dream wedding everything was easy if we asked for it we got it nothing was too much trouble from meeting Justine 3 years prior in Pefkos we loved how she made us feel so relaxed the emails went back and forth so easy with Tracy. What an amazing Day!!! I like to thank Justine and the team for such a smooth ride on our very special day .From start to finish, what a smooth ride!! From fast email responses from Tracy or Justine, step by step guides for getting all your certificates ready, even last minute requests were managed straight away. Michele was fab when we arrived at our resort, I felt I didn't have to worry about a thing. Mel the photographer was great, I am really photo shy but Mel made me feel so relaxed. No other wedding planners could have done it better! We wouldn't change a thing....Best day ever!! Firstly what can we say. We were over the moon with our day. We cannot thank you guys at Unforgettable enough. Right from the get go you have all been fantastic and made myself, Clive and our family and friends feel at ease. Tracy was phenomenal with her support via email, and even met with us when we were in Epping. Her speedy response, and her reassuring confidence was outstanding, especially when it came to losing our original venue. (But can I add we are both so glad this happened).